Ideal for an intimate dinner or small celebration of up to 20 guests. Our private dining packages feature a selection of chef's choice dishes, based off of the seasonal Peck's Arcade menu. Dinner is served family style, beverage packages are also available. We would love to share your special day with you! 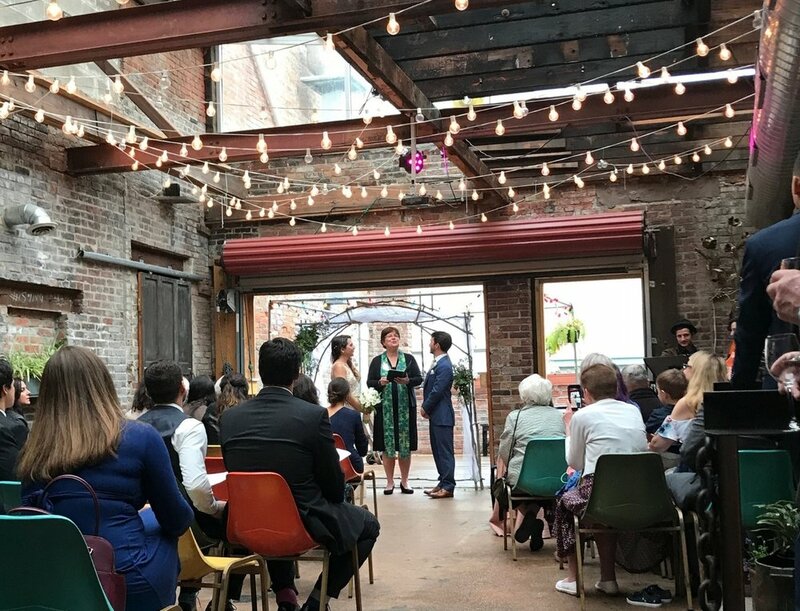 Our garden space (featuring a retractable roof) is available for your ceremony and serves as a beautiful reception space in tandem with the Lucas Confectionery wine bar. For smaller groups, we offer availability in the Library (our private dining room) as well as The Garden for use as a reception space. For parties of 25 or more, we have availability in several of our venues for private parties. Our space is ideal for rehearsal dinners, as well as events such as bridal showers, baby showers, birthday parties, bat / bar mitzvahs and graduation parties. We offer catering services for office lunches, work meetings, and corporate events. We were looking for an intimate place to host our wedding. Our priority was to have really good food and a chill atmosphere. We found the Lucas Confectionery to be the perfect place. The venue layout helped us plan all aspects of our night right there. The garden served a dual purpose: ceremony venue and late-night dance floor. The Confectionery was an ideal space for an informal dinner allowing guest to sit in small groups while keeping a reserved area for our families. Food and drinks were excellent. We got so many compliments from our guests! The small plates from Peck’s Arcade accommodated everyone’s preferences and the wine selection was right on point. Working with the Confectionery’s staff was fantastic. Everyone was very cordial, helpful, and patient throughout the entire planning process. Day-of logistics were easy to coordinate; we felt taken care of. Wonderful experience. We used the garden room for both the ceremony and reception. It was a wonderful place for a smaller wedding. (25 adult guests) Everyone kept talking about what a cool location it was. The glass ceiling over the garden room is also retractable. We had it open to let the fresh air in, but it was nice to know that if it was going to rain that we did not have to make alternate plans. Join our mailing list to learn about upcoming events.